It's true, I'm a political junkie. In high school, my favorite class was Civics. If you catch me watching TV, nine times out of ten, it'll be the news - and politics in particular. The New York Post has published a graphic map for election day that highlights the battleground states, with poll closing times, and trends to watch for as the evening unfolds. I thought it was pretty cool. I'm conservative, so McCain's my man. The fact that he's the underdog is just icing on the cake. The presidential election is something I always look forward to. I'll be glued to the tube all night long. I wonder if the prediction I made many months ago will be correct. I told my husband we'll go to bed election night and still not know who the president is. I think it's gonna be a nail biter. Don't forget to get your free coffee at Starbucks! I do believe this election will be a nailbiter, in spite of the expectation that Obama will win in an landslide. This thing isn't over by a long shot. And, yeah, I like the underdog, too! I'm obviously pulling for McCain. I've got plans to have the coffee brewing for a late night. Just remember, don't put too much weight on the exit polls. They always skew to the Democrat candidate. 2004 was a great example of that. I'm a Canadian but I have to confess this election has captured my imagination as well. I won't be unhappy to see the end of the negative advertising that this campaign has generated. It may win a candidate a few more votes but at the risk of turning off a sizable chunk of the population. My husband thinks that we will have a repeat of the 2000 election. I don't know. The media sure thinks that Obama is going to win and all the polls reflect that as well. But like you I am rooting for McCain. We'll see. I'll be glued to the television this evening as well. Bella - Happy birthday! I don't drink coffee but it's pretty cool of Starbucks to do that. Thanks for stopping by! Hawg - We're in agreement then. Thanks for commenting! Matt - I agree with you. I pay little attention to polls. Have you read this article from NewsMax: "Why Obama Will Lose Today"? 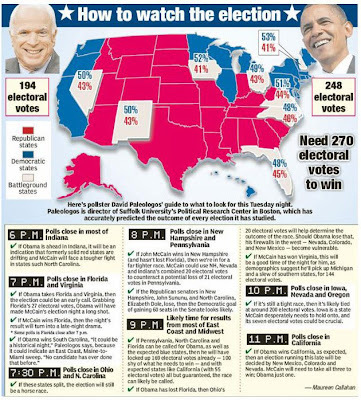 Also, Marston Chronicles is predicting a landslide for McCain. Pretty interesting stuff. Barry - Yeah, I agree. You should be able to state the facts without being so negative. I'll be glad when this election cycle is over too. Cascia - I think it will be like 2000 again too. We'll see! Thanks for stopping by.